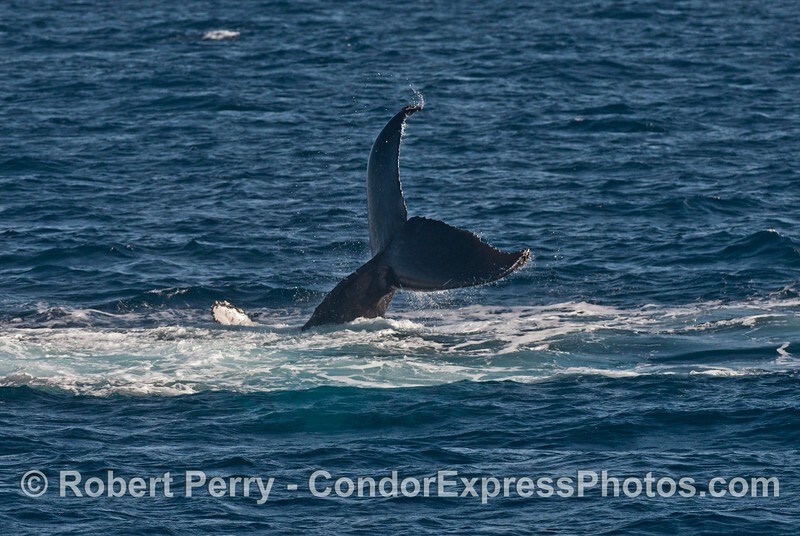 We closely watched at least 6 humpback whales today, with another 7 or 8 in the immediate area. 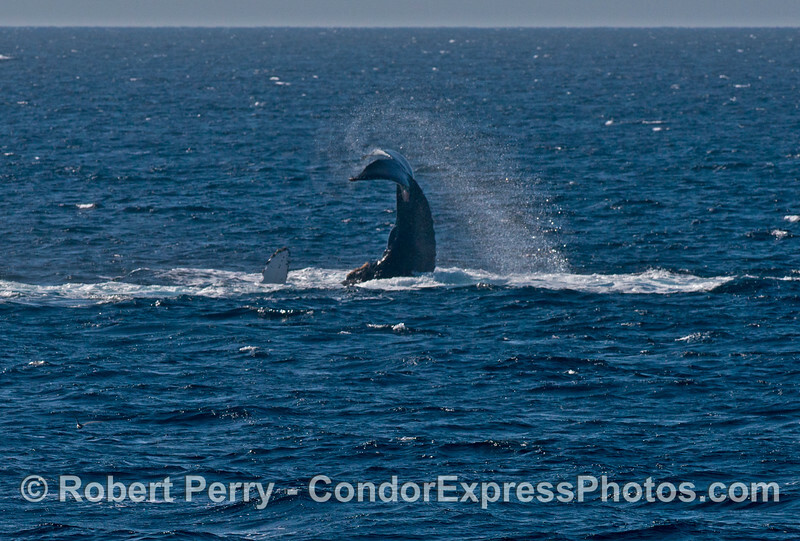 It was the "day of the tails" today. 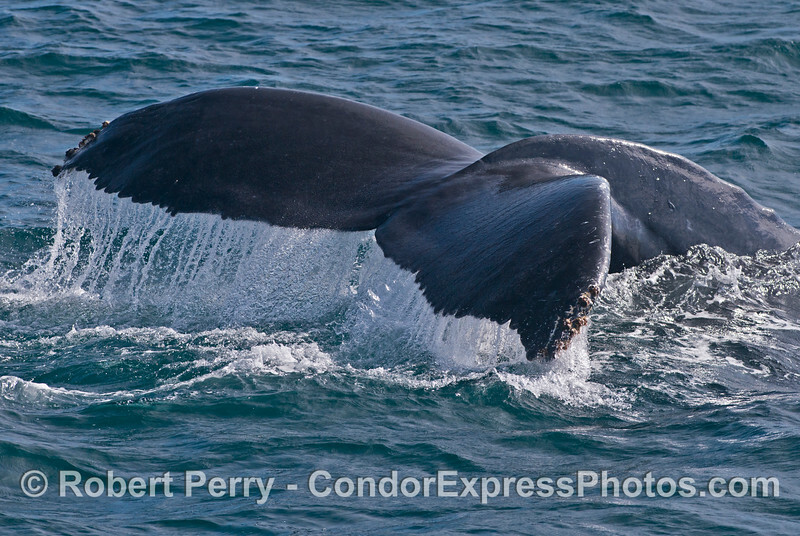 All the humpacks were fluking up, and many had very short down times so we got to see their tail a lot. 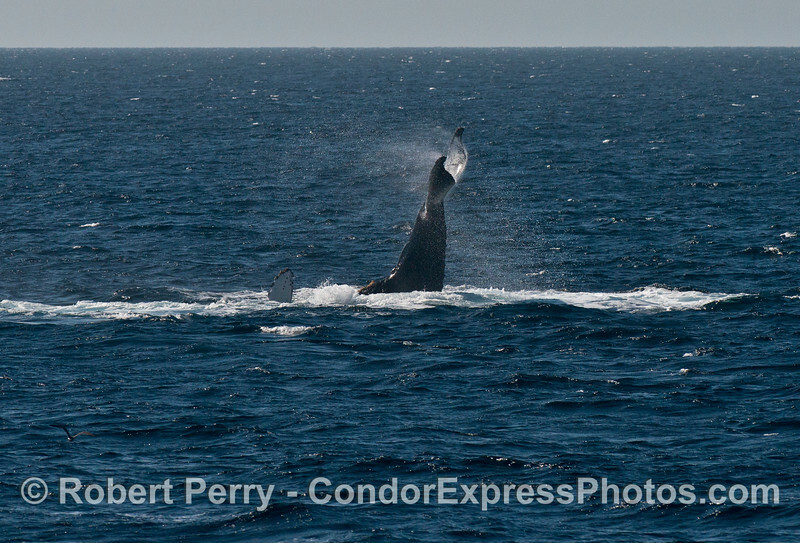 Add to this tail fluking another humpback that did a series of dramatic tail throws, and another 15 minutes of tail lobbing, I decided this was the "day of the tails". There was a light breeze with some tiny white caps on the water today but it was sunny and we had very blue water again. 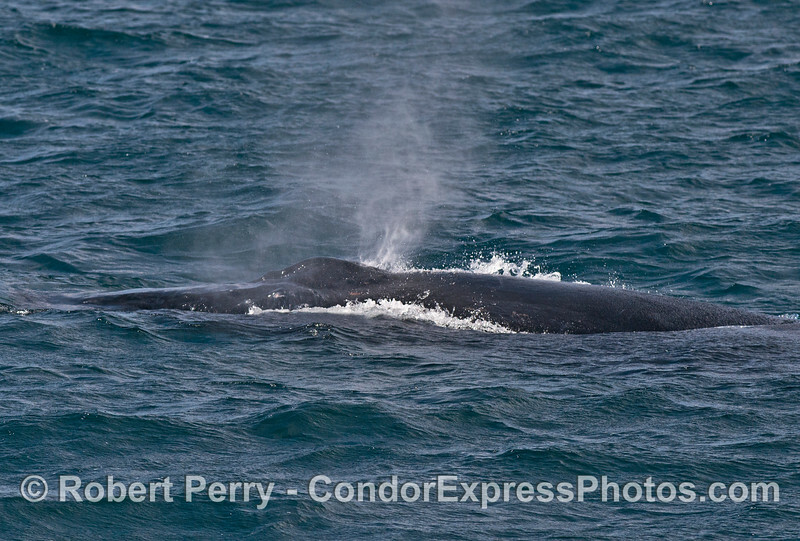 Although I saw 2 Minkes during the trip today myself, I don't think anyone else saw them. 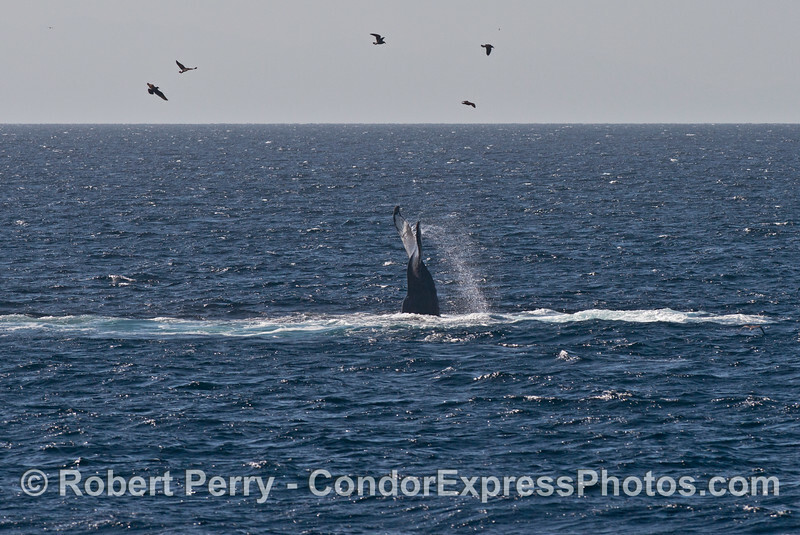 We did have at least 550 common dolphins...probably more....but who can count these rascals? 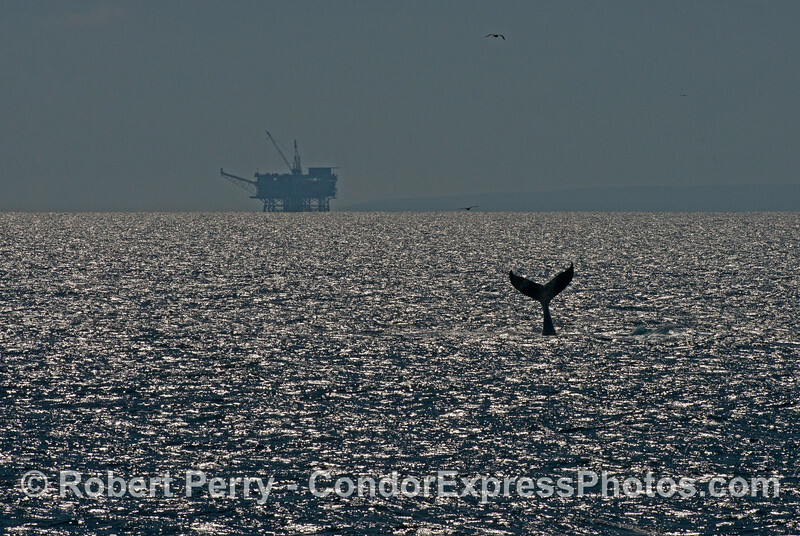 A humpback whale (Megaptera novaeangliae) throws its tail in the sparkling sunlight with oil Platform Grace in the background. 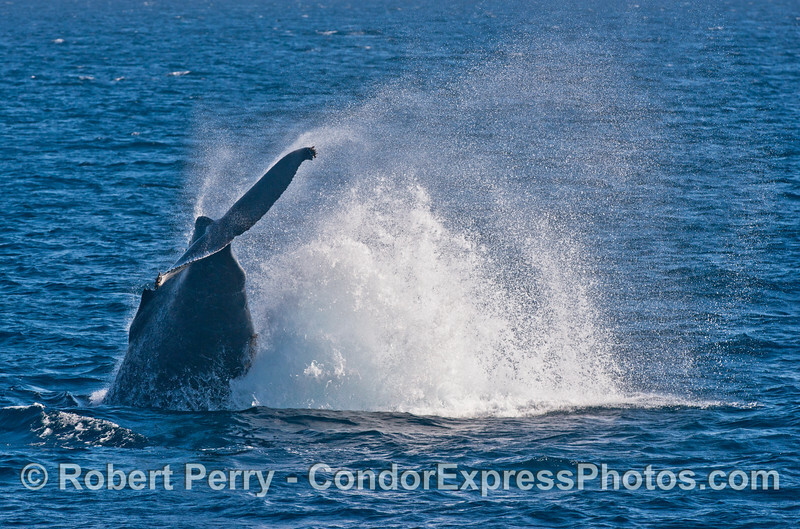 A powerful tail throw by a very active humpback whale (Megaptera novaeangliae). 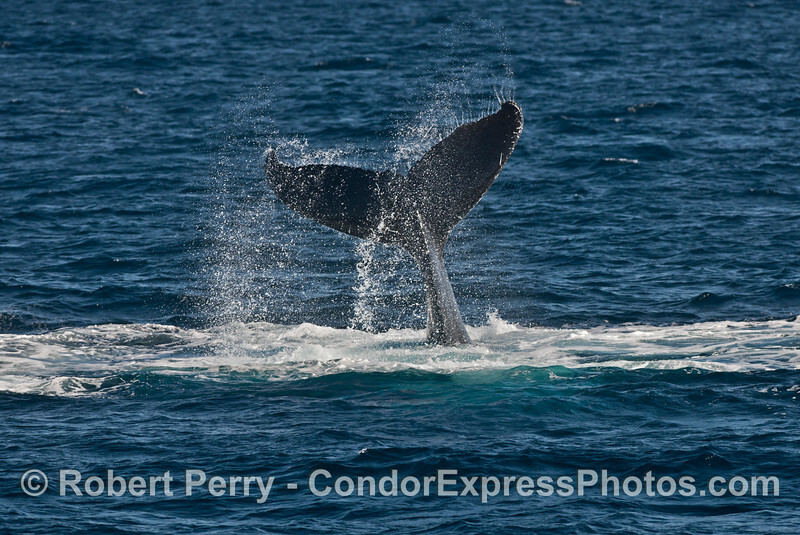 A humpback whale (Megaptera novaeangliae) tail throw. 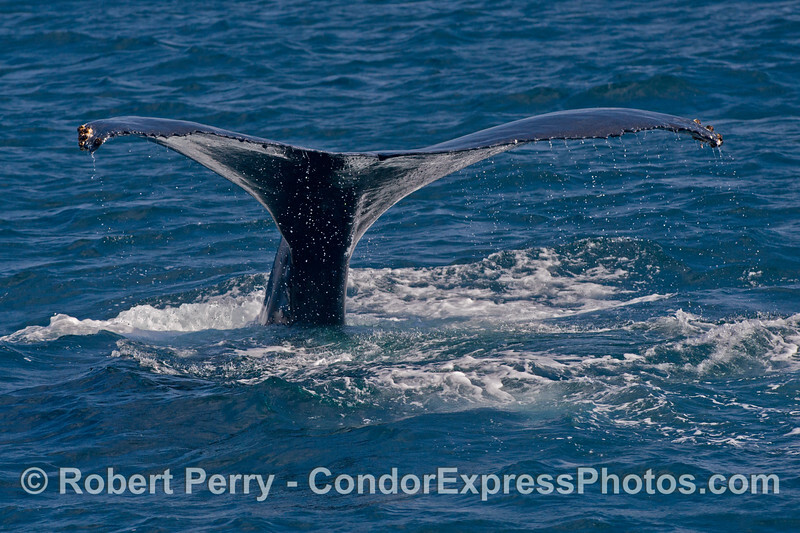 Looking down the broad, shiny back at the exhaled spray from the twin exhaust pipes of a Humpback whale (Megaptera novaeangliae). 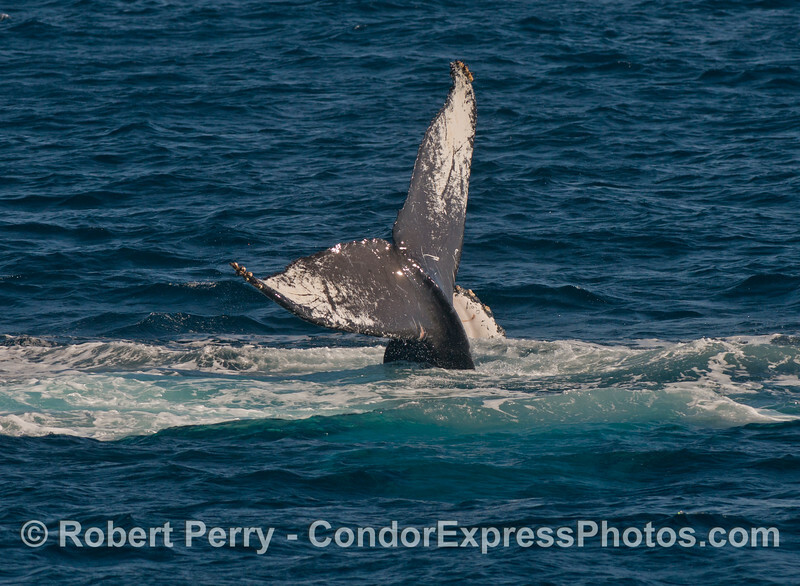 Humpback whale (Megaptera novaeangliae) tail flukes waterfall. 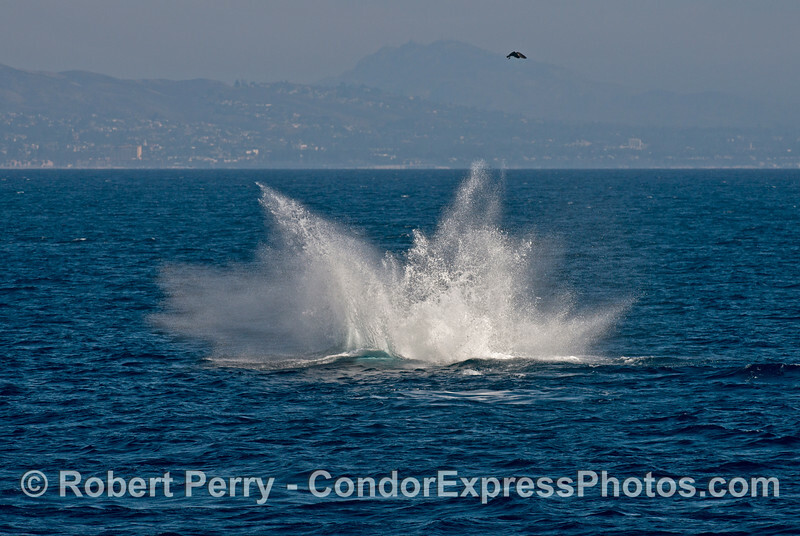 A humpback whale (Megaptera novaeangliae) tail throw leaves a thunderous explosion of spray. 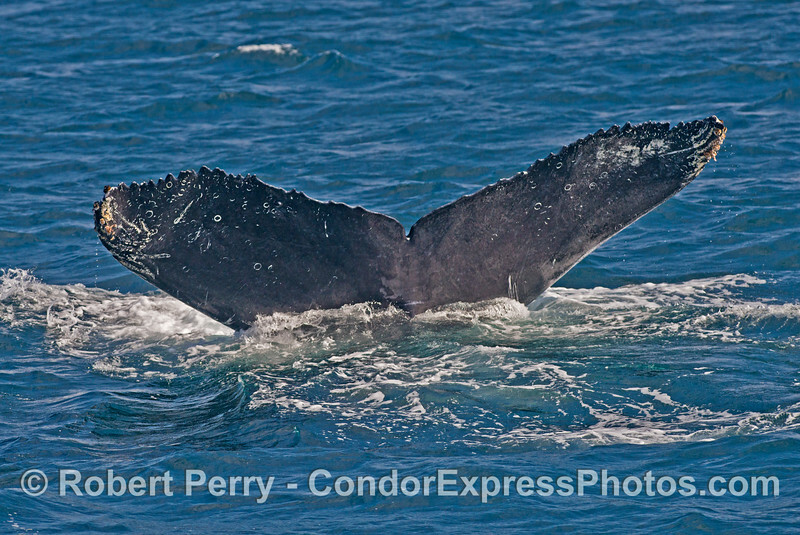 The signature scars on this Humpback whale's (Megaptera novaeangliae) tail flukes show a variety of patterns including what may be the rake marks from the teeth of an Orca. 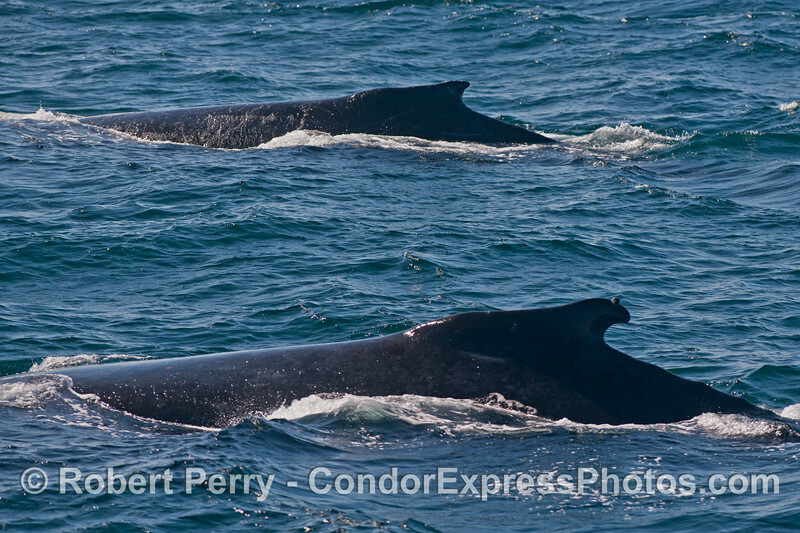 Two Humpback whales (Megaptera novaeangliae) side by side. 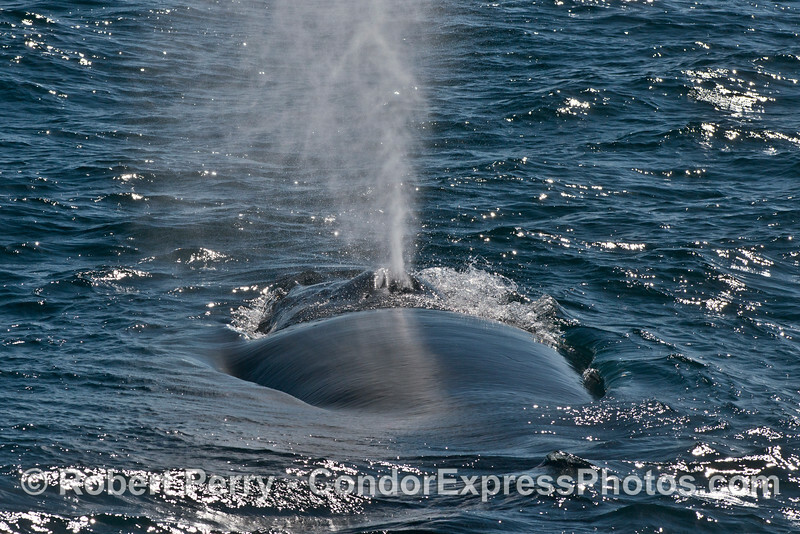 The exhaled spray from the twin exhaust pipes of a Humpback whale (Megaptera novaeangliae). 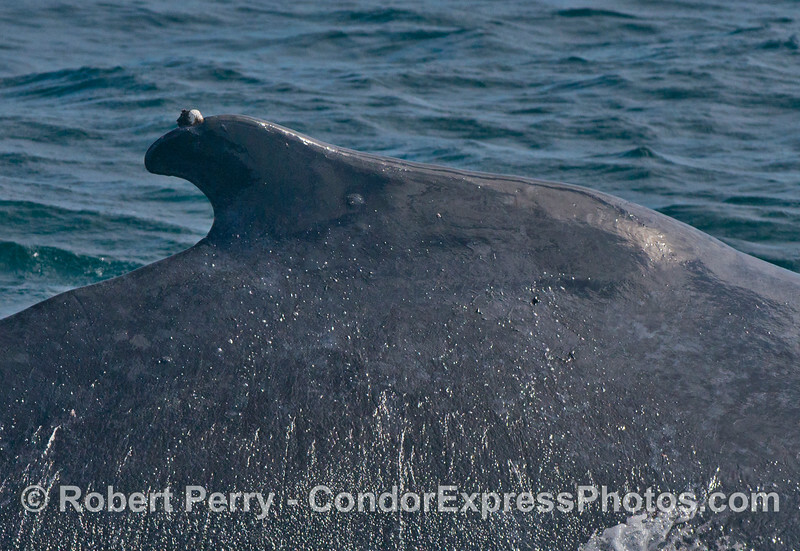 A very close up look at the unique hooked dorsal fin (and barnacle on top) of a this Humpback whale (Megaptera novaeangliae). 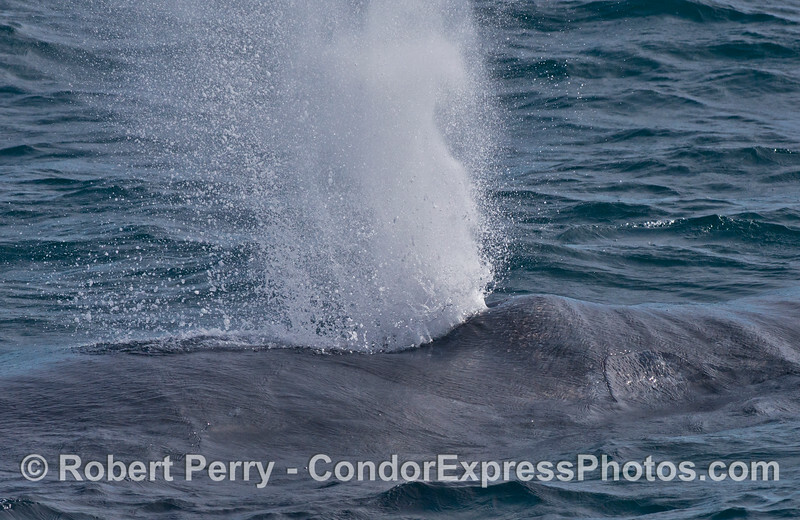 A very close up look at the spout spray of a Humpback whale (Megaptera novaeangliae). 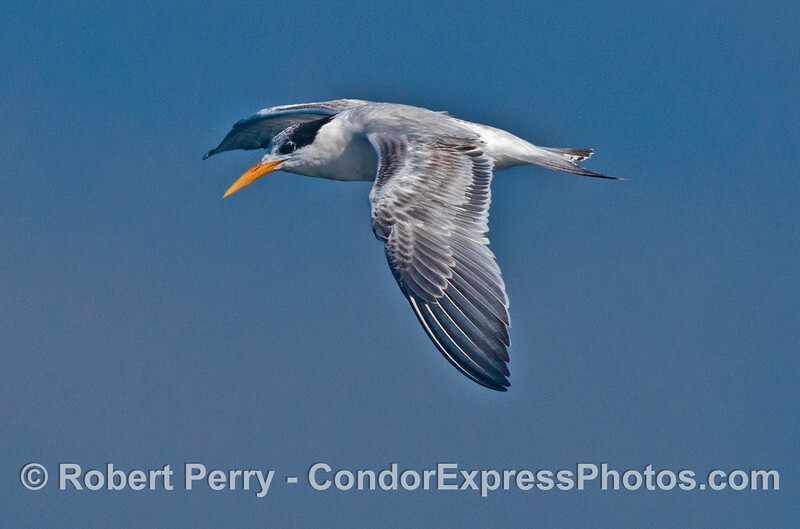 An elegant tern (Sterna elegans). 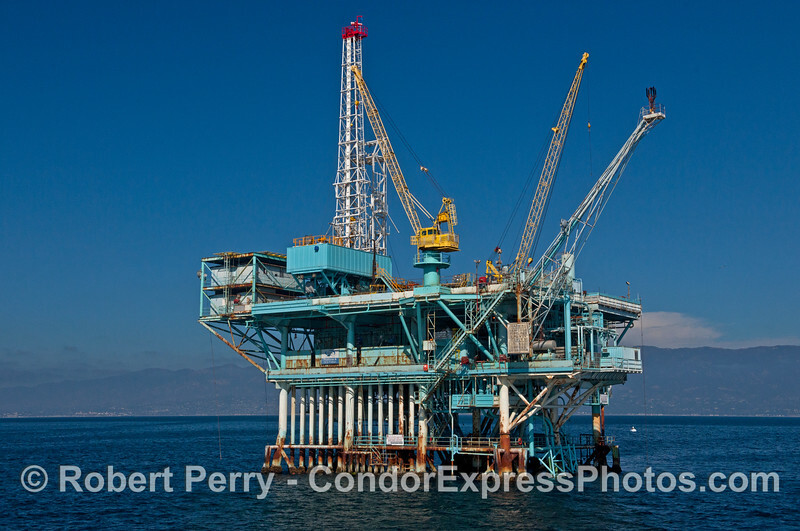 Oil platform A in the Santa Barbara Channel.